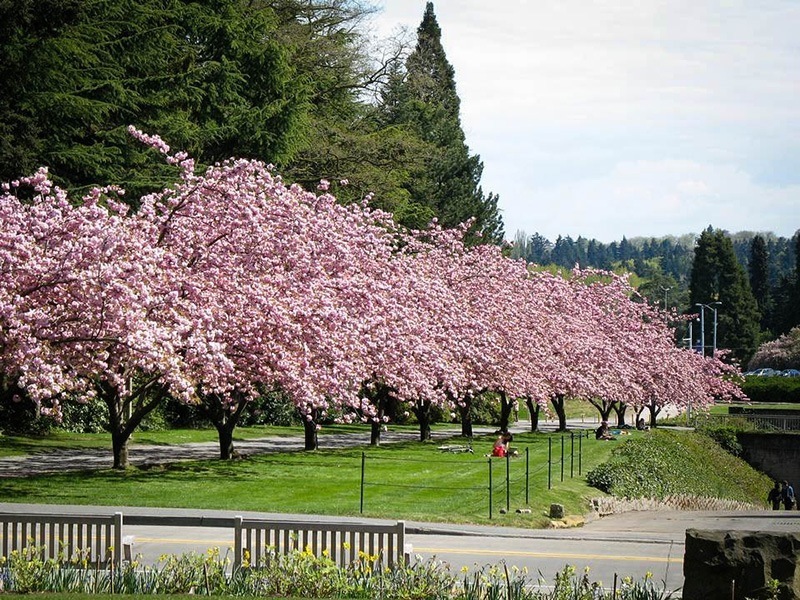 The Kwanzan Cherry is widely regarded as the very best of the many flowering cherry trees. Its beautiful deep-pink double flowers hang in clusters from the spreading branches and make a spectacular display in the spring. They are followed by beautiful leaves that emerge a bronzy-red color and then darken to a deep green. The branches spread outwards and upwards until the tree reaches 25 feet high and almost as much across. It is fast growing, hardy and tolerant of many kinds of soils. Kwanzan Cherry is definitely the queen of flowering trees. Especially for cooler areas, this is definitely the flowering cherry to choose. 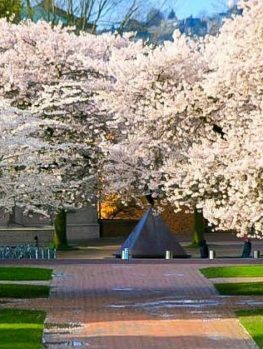 Widely admired in the famous Washington Cherry Festival, this is the pick of the cherry blossom trees. 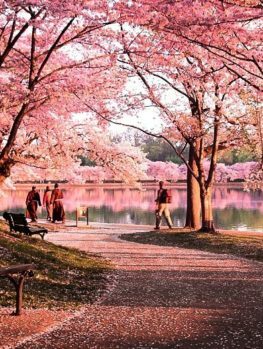 A trip to Japan at Cherry Blossom time is only a dream for most people. Yet that dream can come true when you plant this tree in your garden. Kwanzan Cherry is the result of hundreds of years of breeding in Japan to produce the most spectacular flowering Cherry tree available. The beautiful deep-pink flowers hang from the bare branches just as the new leaves are emerging and make a spectacular show in your garden that will make you the envy of the neighborhood. This is a beautiful tree to place on your front-lawn to be admired by everyone. 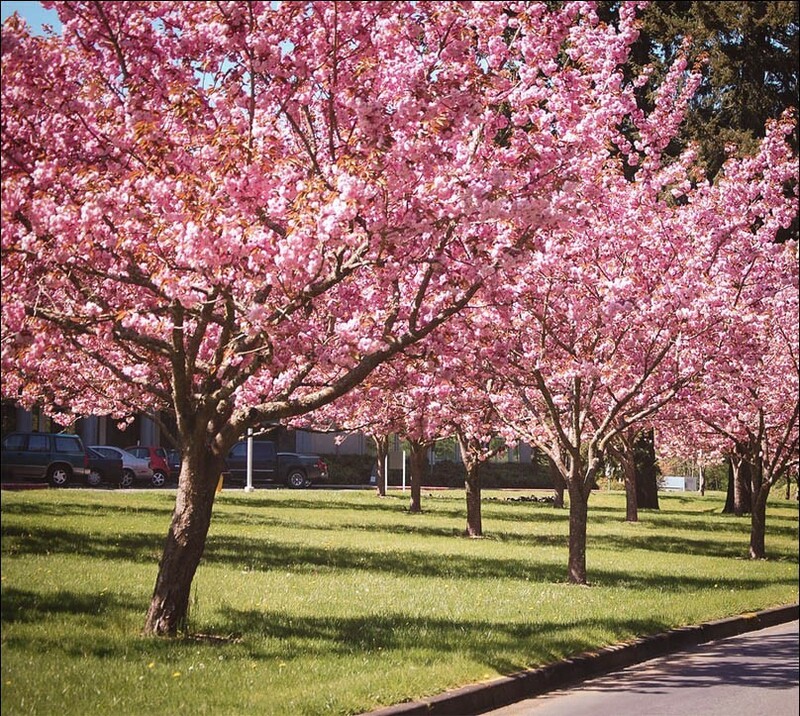 It is usually grown as a specimen – but imagine a driveway in spring lined with these beautiful trees! 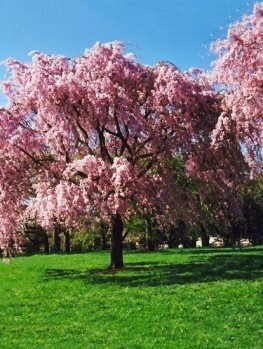 For such an amazing tree, Kwanzan Cherry is fast growing. It can increase by 2 feet a year under good conditions and rapidly develops into a beautiful mature tree to grace your property. 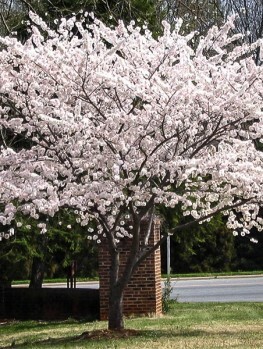 When young you should keep your Cherry tree well watered and fertilize it each spring. Once it is established it will take care of itself and is tolerant of drought, heat and humid weather. 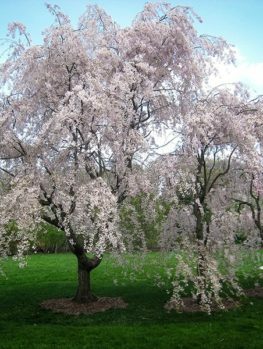 If well-tended the Kwanzan Cherry will give many years of beauty to your garden. The tree grows in a broad vase-shape, reaching 25 to 30 feet tall and as many feet across. The deep-pink flowers are a full 2 ½ inches across, with up to 30 petals. They hang from the bare branches in clusters of two to five flowers, covering your Kwanzan Cherry in pink glory every spring. The beautiful bark is a smooth, chestnut brown color, with interesting horizontal paler bars across it, making a lovely display in winter with the bare twigs. The leaves are oval in shape and around 4 inches long. When they first come out they are a gorgeous bronzy-red color, before turning dark green for the summer. In fall they turn beautiful yellow and orange shades before they drop. This tree produces no fruit, so there will be no mess on your driveway as can happen with Crab Apples for example. Kwanzan Cherry is hardy in zones 5 to 9, right across most of America, so outside the coldest mid-west states, Vermont, and the tip of Florida, you can enjoy this tree. It is definitely one of the hardiest flowering cherries and will grow in colder areas that would not suit other varieties. So if you live in zone 5 and want a flowering Cherry, this is the one to choose. Kwanzan Cherry prefers rich soil without too much clay or sand. It likes moisture but does not like to be standing in wet soil all the time. Once established this tree is quite drought hardy. Kwanzan Cherry does best in sun, but it will take some shade too. It should be planted in an open area where its beauty can be best seen. Allow plenty of room from the house. Dig a hole two or three times wider than the pot, but no deeper. Mix some organic material like compost, rotted manure or peat moss into the soil and add several handfuls of bone meal of superphosphate. Place your plant in the hole, replace most of the soil and firm it well down, keeping the trunk of your tree straight. Then water thoroughly and replace the rest of the soil. 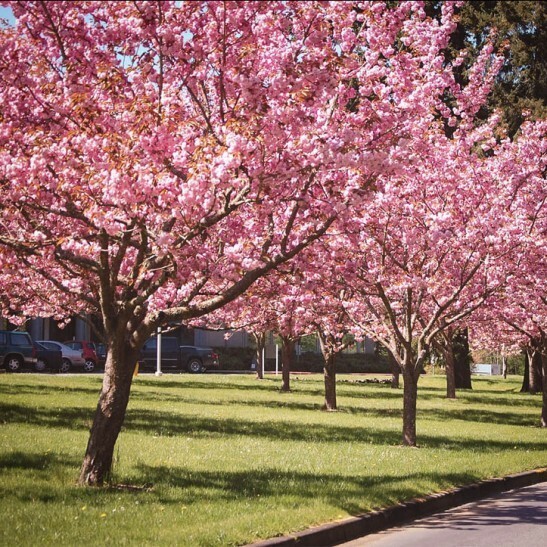 If you are planting a row of these trees, space them 10 to 15 feet apart. This tree needs very little (if any) pruning, except to remove any crowded branches. If you do want to prune it to control the size, do it in the dry days of summer as this protects your tree from disease. Watch for any shoots coming from the main trunk that are a different leaf color or shape. These should be cut off straight away. 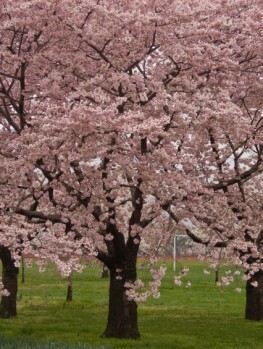 The Japanese Cherry (Prunus serrulata) is a tree native to Japan, Korea and China. It is one of several types of Cherry tree that is grown in Japan for the famous Cherry Blossom Festivals held each spring. They grow wild all over the hills of Japan and the Japanese people have been breeding Cherry trees for hundreds of years. They have selected larger double flowers in different colors, different leaf colors and a variety of tree shapes. ‘Kwanzan’ is certainly one of the best. 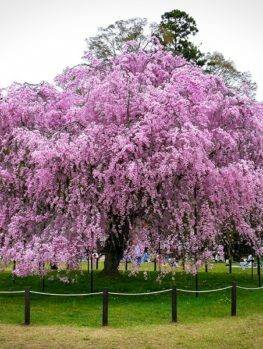 This tree was part of a gift of 12 types of flowering Cherry given to the US by the Japanese people in 1912, and it was originally planted in the Washington D.C. area. 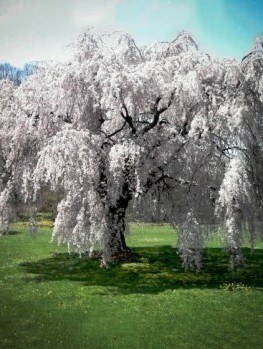 This tree proved so popular and grew so well that it was reproduced across America. 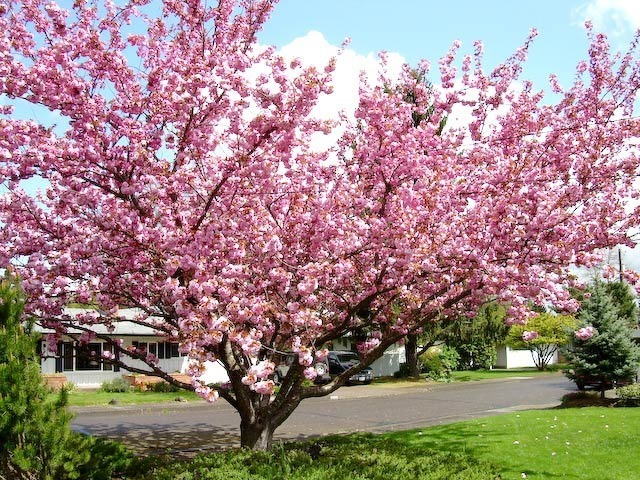 Kwanzan Cherry is definitely the best choice for your first flowering Cherry. Kwanzan Cherry is such a special plant that only this exact plant will have the right flower color and beauty. So it must be produced directly from trees absolutely known to be right. Our trees are grown the correct way, from grafts of these special trees. That way every tree is identical to the original. However these take longer to produce, so avoid cheaper, seedling trees that will only be a disappointment.